Corazón News — Corazón | Mexican Restaurant and Bar Soho London. Our speedy new lunch menu includes totopos, salsa, guacamole + any two tacos. That’s right, mix & match tacos at lunch only! Valid Monday - Friday lunchtimes up to 4:30 pm, but not with any other offer, por favor. To celebrate Day of the Dead this year, we’ve teamed up with Cazcabel Tequila to host a one-off brunch complete with bingo game ‘La Loteria’ on Sunday, 4th of November, at Corazon..
Tickets are £15, and include drink on arrival, Mexican brunch and … LA LOTERIA! Plus a selection of Cazcabel cocktails will be on offer for all customers at an additional £5 only. Menu, details, and tickets all available here. London Cocktail Week is the biggest, most vibrant celebration of our capital's fantastic cocktail scene and the biggest event of it's kind in the world. With 300 bars signed up to the Cocktail Tours and a week-long cocktail village at it's heart, this is the ultimate week-long excuse to call in sick. As part of the festivities, we’ll be serving The Mayan Honeypot 🍯🍍🍋with Guanabana Rum Liqueur + Casamigos Reposado, Pineapple, Lemon, Honey & Lavender. Guanabana Liqueur comes from fermented soursop fruit, native to Mexico. On all next week for just £6 with your pass to London Cocktail Week. We’re pleased to announce that beginning Sunday, 30th of September, Corazon will be open to meet your Mexican cravings with an all-day service. We’ll open at 11 am and go straight thru, with last bookings at 8:30 pm. For all you Sunday regulars - fret not - we’ll be still dishing up your favourite huevos / chilaquiles / breakfast taco hits until 4 pm. TASTE OF LONDON ... you beautiful beast! We held fort at Taste of London for five days this June, and it was sincerely the time of our lives. 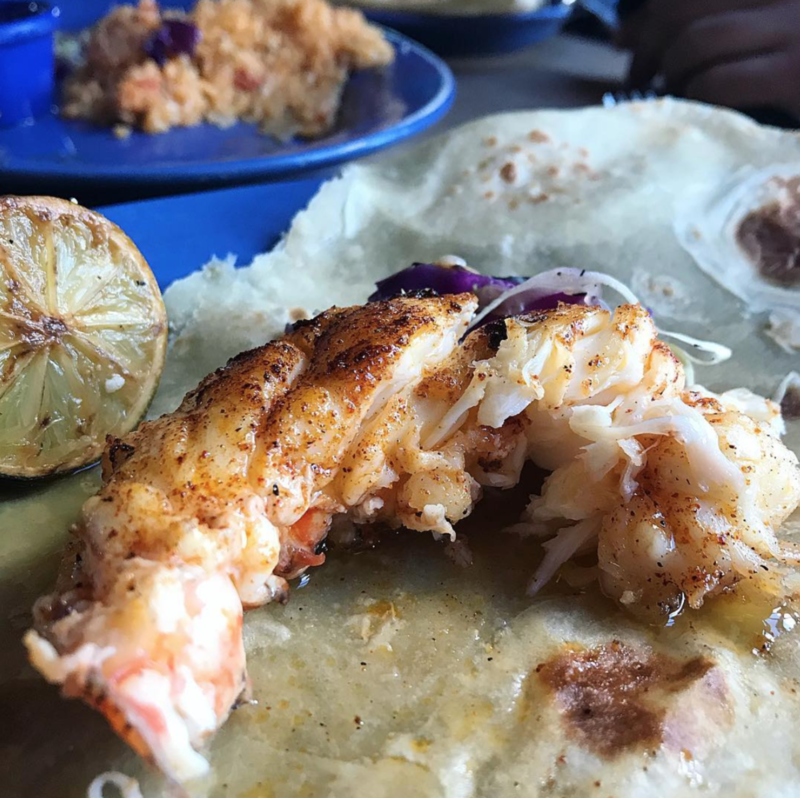 We served literally thousands of tacos, mole fries and this ➡️➡️epic lobster seafood cocktail, our Taste Exclusive Dish. Afterward, we needed a little siesta! Not gonna lie. Now, we're back on Poland Street and look forward to welcoming all our new friends from Regents Park, very soon. There will be special Pride cocktails, camp tunes, free-flowing fruity margaritas, tequila, love and full bellies - all seconds from the parade. Plus you can forward to our limited-edition hot pink ‘Pride Taco’ with Grilled King Prawns served on a Beetroot Pink Tortilla. Soho Food Feast is back again for it's eight year in 2018, working with some of London's top restaurants to raise money for Soho Parish Primary School. Explore the many different restaurant stalls, and be entertained by live music, an amazing raffle, children's activities, live cooking demos, great wine and cocktail bar options. We're appearing on Sunday the 10th, serving taster portions of our Carne Asada tacos, Esquites and Coconut Flan, and Chef Paul will be leading a demo in the church hall, sharing the secrets of our Huevos Rancheros with eager home cooks. Tickets are sold in advance; available to buy here. 2018 has been quite a year for us thus far, but we’re taking that up a notch next week with Corazon's first annual Cinco de Mayo celebrations. Our bash will stretch the whole Bank Holiday weekend, all in the spirit of MAKE MARGARITAS, NOT WAR // BUILD TACOS, NOT WALLS. In a geopolitical climate of doom and gloom, why not just celebrate peace, love & Mexican food!? Tickets are available thru Tonic and can be redeemed any time Saturday - Monday, 12pm-6pm. We love a bit of praise - self aggrandising is one of our greater talents. Its a sort of Dutch / Mexican courage. Your feedback is lovely of course - but being honest, now we'd like a trophy for our tequila shelf. With that in mind, TIME OUT has launched a 'Show the Love Campaign' and we encourage you to get involved and VOTE FOR US. Support the businesses you adore in London -- ideally, small independent ones that keep on trucking, looking after you with heart and soul. Or more feisty mums can take advantage of our 'Bottomless Brunch' - with unlimited Mimosas, Bloody Marys, Hibsicus Fizz and Jasmine Tea Frozen Margaritas. It's just her cup of Tea-quila. Cinco de Mayo is the most ambiguous of holidays – celebrating an obscure and unlikely military victory, which many confuse with Mexico’s Independence Day. But it is the very essence of a great party. A few margaritas in, does it really matter why we’re celebrating? Our bash will stretch all day Saturday and Sunday of the Bank Holiday weekend, giving you two full days to party like an adult (mostly). There will be live mariachi music, salsa & guacamole tastings, samplers of new dishes, plus a special new and expanded agave list to explore. Join us for a dinner, or a restorative brunch – or both! We’re only reserving half our tables. If you can’t book a spot, please just pop down; we'll be running a short queue and sweetening the deal with surprise perks whilst you wait. As a treat for all your beautiful, hardworking madres, we have commissioned fresh and beautiful, Mexican-inspired bouquets 💐🌺 - our gift for each of the first 20 mums in for lunch. This year (our third Christmas!!!) we've got a different sort of holiday magic to share with you - one that evokes a sunny, retro Mexican spirit. Merry, Jolly, and Joy- these are words that you will best understand with a margarita in your hand. Our Christmas Menus begin from the 22nd of November and are full of iconic dishes and drinks from Mexico, albeit with a distinctly Corazon spin. Join us on the weekends for our new ‘Brunch Margarita Flight’ - a tasting of four margaritas for just £20, including this Café Margarita, a tasty marriage of Calle 23 Reposado & Kahlua. It also includes our signature Corazon margarita, an achiote margarita, and a Guavarita. CHRISTMAS. There, we said it. After a killer 2017 Christmas season (remind us to tell you about the company which crowd surfed their boss through the restaurant... ) we're planning a bigger fiesta than ever, with spaces filling up swiftly. Tidings of comfort & tequila, for both you, and us, may be in order. Stuff the stuffing - we've got lamb birria, duck carnitas with salsa verde, those turkey mole tacos, and calabaza en tacha - a dressed up candied pumpkin, served with spiced syrup and clotted cream. Fill your Christmas party with soulful Mexican food, and the spirit of sunshine, whatever the weather. We’ll get the rum punch ready; meanwhile, have a look at our Christmas pack and drop us an enquiry online. Rich, red Pozole Rojo with pork; tangy Pozole Verde with chicken. Plus of course, all the trimmings. 🥄A taster plate of both is on special all weekend Friday - Sunday. ¡Viva Mexico! 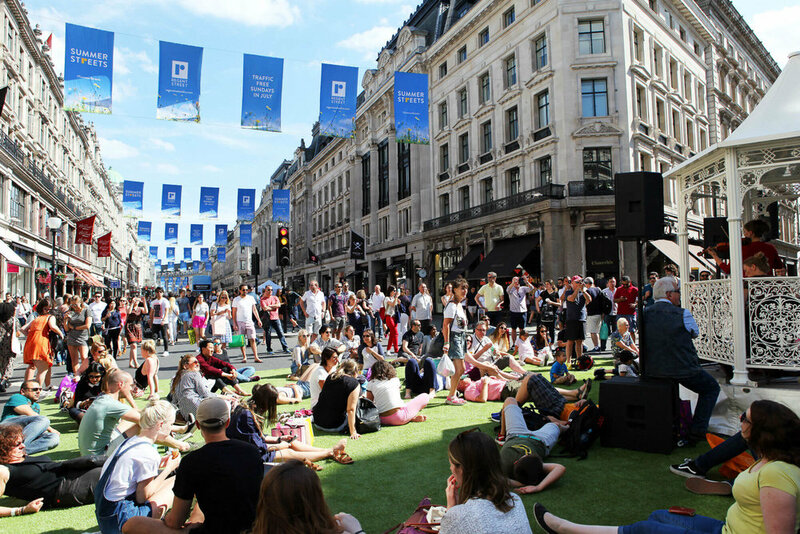 Every Sunday from 1st – 22nd July, will see Regent Street become pedestrianised from Oxford Circus all the way to Piccadilly Circus, offering the chance for Londoners to relax, unwind and enjoy a fantastic range of entertainment and activities along the street - entirely for free! Come down for live music, pop ups and workshops for families and grown-ups alike. There'sa living wildlife maze, and even a 'meditation bus'! Every one of these Sundays, Corazon will be serving tacos & margaritas in the Summer Streets Food Quarter, a pop-up food market with the best drinking and dining destinations across Regent Street. And when you're done with the outdoor fun, make the short hop to Corazon where we're offering 10% off your bill, whilst the festival is taking place. It’s official! Join us in the sunshine 🌞@tasteoflondon - the UK’s top food festival. London’s best restaurants, yours truly included, showing off their signature dishes. We'll be dishing up our Carne Asada Tacos, Baja Fish Tacos, Mole Fries, and a special Lobster Coctel de Mariscos. If you just can't get enough of our Cinco de Mayo action, we're taking over the Brewdog Soho kitchen, Monday the 7th of May, Midday - 11 pm. Enjoy some of the UK's finest craft beers alongside its most finely crafted tacos. Studiously debate whether a California-style IPA pairs better with caramelised flavours of pork carnitas, creaminess of guacamole, or the crisp lime scents of baja fish. In this argument, everybody wins. Being as we are, specialists in both hangover cause and cure, we know any good bank holiday party has to include a cracking, restorative brunch. For our 3-day brunch fiesta, Casamigos giving each table a FREE flight of their 3 tequilas (!!!) paired with Corazon’s our signature Sangrita and new Verdita, while supplies last. We'll be debuting several new dishes, and you'll enjoy live mariachi performances booked over the three days. Bookings available Saturday, Sunday and Monday thru to 4:30 pm. Click to book. Another tour of sorts, this time inspired by everyone's favourite Mexico-loving president, in case you too are feeling the need for a stiff drink. Whilst we try not to get too political, we felt this was an absurdity London could embrace, or at least drink to. And let's face it, there's no shortage of material. Join us for a limited-edition cocktail list which includes amongst others, the ImPEACHment Margarita, Dark & Stormy Daniels, and the Harvey Wallbuilder. Best served with an IOU from Mexico. Due to popular demand, we've now made our bar counter reservable at off-peak times, for groups up to three guests. The same menu is served at both the restaurant and counter. Reservation times are up to 6:30 pm in the evening, Monday to Saturday. After the first sitting, the counter is operated on a walk-in basis. You are very welcome to come by, put your name on our wait list, leave a number and we'll call you when your seats are ready, whilst you enjoy a drink nearby. Corazon is proud to team up with our friends and neighbours at Mac & Wild, to serve a unique collaborative taco, the M&W Venison Carne Asada, utilizing the celebrated Ardgay Gamevenison that has become synonymous with the renowned Scottish restaurant. Mac & Wild serves un-fussy, understated Scottish food using high-quality ingredients, much like what we have tried to do with respect to Mexico. The M&W Venison Carne Asada has been lovingly created by our Chef and Co-Founder Paul Daniel, and consists of lightly grilled venison topside from Mac & Wild, spiced achiote marinade, pickled turnip, crispy fried kale leaves, smoky chipotle mojo and & redcurrants. Priced at £10 for 2 tacos and launching on Monday 15th January, the dish will be available for two weeks at both Corazón in Soho, and at Mac & Wild in Fitzrovia. This 31st of January we launch the first of our one-off producer led dinners aimed at celebrating our love and appreciation for independent and innovative UK producers. The first of these collaborations will see chef Paul team up with James Whetlor of Cabrito, the award-winning kid goat supplier and specialist. As an ex-chef, James founded Cabrito in 2012, feeling he should do something about the waste of male billy goats by the dairy industry – he thought that there had to be a better solution than euthanizing them as a by-product at a few hours old. Calling on his 10 years’ of chef experience and contacts, James set up Cabrito Goat Meat and began working with goat dairies to supply some London’s most celebrated restaurants. Take it from the experts - we're at the 'top of the heap' when it comes to choices of where to take your Christmas Crowd. Join us for lobster coctel, turkey mole tacos, lamb barbacoa sharing platters 'with all the trimmings', and a punchy Ponche Navideno (a warm, rum based 'xmas eve' punch ooh la la). Available for groups of 10 to 50, starting from the 20th of November. Email our lovely Christmas coordinator at hola@corazonlondon.co.uk to enquire / book. TIME OUT: The Review is in! Thanks Time Out and Tania Ballantine for a glowing review in this week's Time Out. You get us! We're proud of our four stars and look forward to building on them over the coming years. Have a peek at the full review here .